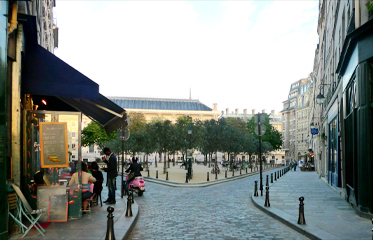 Place Dauphine is one more of the "special" squares in Paris. It lies literally right in the center of Paris on the I’le de la Cite. It was initiated by Henry IV in 1607, the second of his projects for public squares in Paris, the first being the Place Royale (now the Place des Vosges). He named it for his son, the Dauphin of France and future Louis XIII, who had been born in 1601. The history and architecture are still the same, but the tenants have changed hands just a few times. It is a quiet and peaceful spot, surrounded by large red brick buildings, faded grey cobblestone walks and a lovely park with trees and benches in the center. On nice sunny days, you will find men playing petanque [french version of boules or italian bocce] and Parisians walking their adorable, well behaved dogs. There are no cars on these small cobbled paths, occasionally only slow speed scooters, which makes it seem much more secluded and far-removed from the center of Paris. To the east, or the narrow part of the triangle, is the Pont Neuf [completed in 1606], the first bridge built across the Seine, and a platform supporting an equestrian statue of Henri IV (installed in 1614). The former eastern edge, heavily damaged by fire during the fighting of the Paris commune of 1871, was swept aside to open the view toward the Palais de Justice. On the map bellow from 1609 Place Dauphine is clearly marked as fully developed including the row of buildings on the north side. We really like this squares but special treat was one evening when local dance class practiced here their tango lessons. 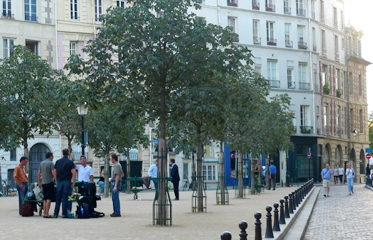 One more space – small park, just beyond above mentioned Pont Neuf, has special significance to me. In my "hippy" days back in 1970's this was my residence during the stay in Paris?! Don't miss to enjoy 4 minute video of the evening, bellow, when locals practiced their tango on this Place. urban squares initiative is licensed under a creative commons attribution-share alike 2.5 canada license.